Awnings are a classic and practical addition that can provide shade for any area of the home, be it a patio or a window that takes too much sun. At Sunesta, we custom-manufacture awnings to the precise specifications of our customers in Springfield, Massachusetts, ensuring a perfect fit no matter where they’re going. Additionally, Sunesta offers the largest selection of fabric styles in the industry – with more than 150 colors and patterns to choose from – which makes it easy to find a look that beautifully complements any home. Our awning fabric is woven from 100 percent solution-dyed synthetic fibers. The solution-dying process ensures that the fabric is dyed all the way through, preventing color loss, and the synthetic fibers are naturally resistant to the growth of mildew. Our frames are made of metal that is powder-coated in a finish that’s four to eight times thicker than paint, which helps to prevent scratching and rusting. Our awnings are exceptionally wind resistant. In fact, they have been approved by the Miami-Dade County and Florida Building Codes for their unprecedented ability to hold fast through strong wind gusts. At Sunesta, we are committed to the satisfaction of our customers in Springfield, MA, and the surrounding communities. Unlike some other manufacturers, we won’t just sell you an awning and then leave you in the dust. Not only are our awnings covered by warranties on the fabric, frames, and motor, but they also are all marked with a unique SmartCode‚Ñ¢ – a number that will allow us to provide you with personalized assistance should it ever be needed. 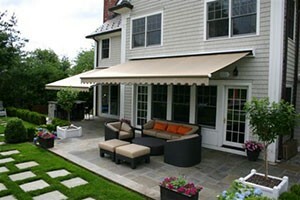 For more information about our awnings, call 1-800-SUNESTA today. We proudly serve homeowners in Springfield, MA, and all surrounding communities.